I have just finished up another competition, the PanAmerican Championships in Guayaquil, Ecuador. This was my first PanAmerican Championships and my first trip to Ecuador, so it was a trip to remember for many reasons! I flew to Ecuador on the Wednesday before Thanksgiving with an early 5:30 AM flight from Phoenix. After 2 quick stops in Houston then Panama City, we finally arrived in Ecuador that evening. Both of my parents came with me on this trip, so it was a fun day of travel for all of us. On Thursday (Thanksgiving) we walked to the river in Guayaquil and then spent the rest of the day laying by the pool at our hotel. Arizona isn’t as cold as other states in the winter, but it was nice to enjoy the balmy weather! Thursday was a fairly relaxing day since I had to compete on Friday morning. Friday morning began bright and early with isolation opening at 7:30 AM. I climbed 10th in the running order, so I was able to get a good warm up and wake up a little bit before I had to climb! Below is a video of all the qualifying boulders and then a breakdown as well. Boulder 1: An awkward start that lead into a mantle finish made this boulder a little nerve-racking for the first boulder of the day! Luckily I escaped with a flash. Boulder 2: This was definitely the trickiest boulder of the competition. Being stuck in a corner and standing on a Flathold, the most difficult move was catching the finishing jug because it was so difficult to see. I reached the zone on this boulder. Boulder 3: The first move of this boulder meant business! It was really difficult to catch the first crimp and coordinate the foot stab at the same time. I reached the zone on this boulder and struggled near the finish. Boulder 4: A welcome relief after boulder 3 being so difficult, boulder 4 was technical and slow moving. I reached the top on this boulder. Boulder 5: Arguably the most difficult boulder of the competition, this boulder became rough right off of the start with a rose move. I reached the zone on this boulder. My score for qualifiers was 2T5Z 2 12. This put me into third place heading into the final round. Since I was done climbing at around 11:00 AM, I was able to do some sightseeing later in the day. After lunch and a nap at the hotel we went to Parque Seminario where you can feed iguanas! I love animals, so I was in heaven! I even had three or four iguanas on me at once, it was awesome. After seeing the iguanas we went back to the hotel, grabbed dinner, and I went to bed early in preparation for the final round the next morning. Finals were interesting because they took 10 athletes to finals, so it made for an extra long round. Luckily we were able to return to isolation in between the boulders, which helped us stay cool during the hot and humid day. Below is a video of the final boulders and a breakdown. Boulder 1: The beginning of the boulder involved a double toe hook and a small jump out to the decent zone hold. Past this you latched onto a tiny, tiny crimp and had a big lock off to the top. I flashed this boulder. Boulder 2: Set in the corner on the lead wall, the most difficult move was definitely moving from the zone to the top. It was precarious to get your foot on the zone hold and stand up all of the way to the top. I also flashed this boulder. Boulder 3: Beginning with a small dyno, the top move was a tricky press that involved fully committing while your foot was on a small foothold. I also flashed this boulder. Boulder 4: With an awkward, crunched start, this boulder was fun, but also nerve-racking! On my second attempt I reached the zone hold and fell off of the second to last hold, which felt terrible in the heat! To celebrate my win I went back to the iguana park to visit the iguanas and then had a nice dinner with Kyra Condie and our parents. Overall, PanAms was a great experience and I am so excited to have attended this competition and enjoyed such a wonderful country! The US Team did an amazing job in general by sweeping up many medals and winning the Team Competition as well. It was a great feeling all around! Now I am back home and am onto my next adventure, which is training for the Combined Nationals in January. It’s time to hang up my “bouldering only” hat and delve into some speed and lead climbing! I am writing this blog in a very, very happy mood! I am fresh off of winning my first professional competition… EVER! This weekend I competed at the Mesa Rim Pro-Am in San Diego, CA, the second National Cup of the season. I’ll give you a quick breakdown on how the weekend went and share some videos of the boulders as well. Qualifiers took place on Friday evening with a large number of competitors, over 40 women and 100 men competed in this incredible event. With so many people I worried about the redpoint round being too crowded, but it actually worked out quite well for the women. I climbed 8 of the 10 qualifier boulders, putting me in a solid 4th place. It was difficult to tell exactly how I was doing during the qualifying round, but I knew that I had climbed my absolute best. I spent Saturday morning relaxing with a quick trip to the beach and then my standard pre-comp nap. I felt great going into finals but really didn’t have any expectations. Just making it into finals is such a feat that I focus on having fun and trying to give my best effort on each boulder problem. The first boulder was a delicate slab that I nearly timed out on. I spent the majority of my time at the top of the boulder where I tried to match the top with my finger tips. I was just a little short of achieving the finger tip match, so I had to jump with one hand to reach the finish. This boulder took me almost the entire time to complete, but it was well worth the wait! I was lucky to walk away with a flash on this boulder. The second boulder didn’t go quite as well as the first. I tried hard, but I ultimately got stuck at zone 5. The boulder was straight forward, powerful, and just simply hard. 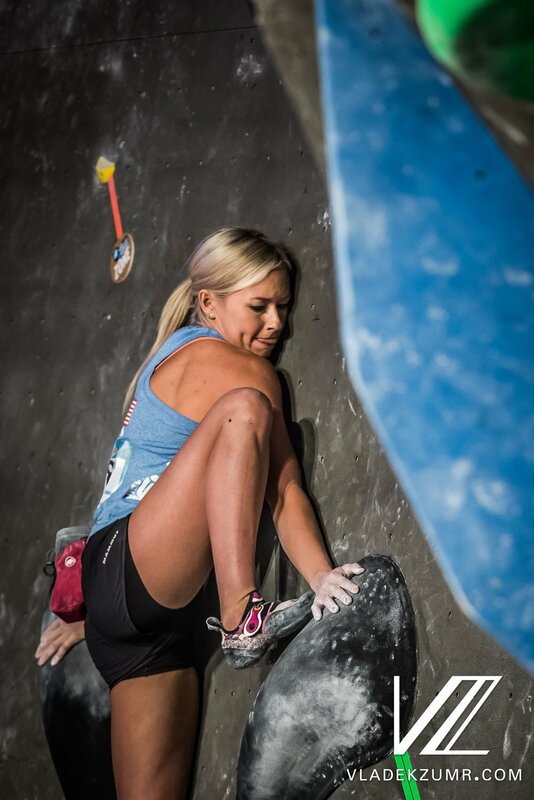 The third boulder began with a run across jump, to a delicate crimp section, then a jump for the finish hold. I was proud of myself for sticking the run across (this is something I have been working on in training), so sending the boulder was the icing on the cake! The fourth boulder was a definite power boulder. The boulder began with a jump to a large hold, then you had to work your way through holds in the roof to reach the top section. Having this boulder as the last boulder in the competition was definitely taxing, but I had a good burn on it and reached zone 10. After completing my fourth boulder I knew that 4th was the worst place I could finish. I was definitely happy with that result, but I was also crossing my fingers that I would make a podium finish! I had absolutely no idea I would walk away with 1st place until about 10 minutes after I finished competing. I literally did not believe my dad when he told me that I most likely won. Once I found out I officially had won I proceeded to run around the gym and hug everyone I knew. I have never won a professional competition before, so this moment felt incredibly surreal for me. It still feels surreal to me as I write this blog. All in all, this weekend was AWESOME. I had a great time climbing with my friends and winning this comp is a dream come true. Up next on the agenda is a training camp in San Diego, which I am also very excited to attend! I love climbing with so many strong women during the comps and I cannot wait to have the opportunity to train with these strong women this week! This blog is obviously way overdue…but after the Vail World Cup I was swamped with packing and preparing for my Iceland trip! Since we are so delayed…I will jump right into it! After being home from Tokyo for 2 full days, I flew to Denver on Thursday with my parents. My mom has traveled with me to all of the World Cup’s this year, but my dad made the journey to Vail as well! After landing in Denver and picking up our rental car, we made a quick stop at True Food Kitchen (a favorite restaurant that we also have in Scottsdale), grabbed everything we needed at Whole Foods, and made the 2 hour drive to Vail. Once in Vail I caught a quick nap and then made my way to the US team meeting we have every year in Vail. This year USA Climbing brought extra jerseys they had from previous years, so I was able to take home some great jerseys to train in at home! Qualifiers began on Friday afternoon for women. This was especially nice for me because I was still holding onto some jet lag from being in Tokyo the previous week. The boulders were set hard in qualifiers. A video and breakdown of the boulders is below. Boulder 1: Beginning with a mantle, the boulder then turned into a semi-delicate slab. I sent this boulder on my second attempt. Boulder 2: Volumes, volumes, volumes is the only way to describe this boulder. Despite my best efforts, it felt really difficult. Boulder 3: The hardest move on this boulder seemed to be the huge right hand gaston to a big, incut crimp. Boulder 4: This boulder was an integrated dyno with a tricky top section. Boulder 5: Even though this boulder was on a slightly overhanging wall, it felt more like a slab. Luckily I was able to complete the boulder in the last minute of my climb time. Ultimately, the boulders were set HARD this round. My score ended up being 2T6 2Z5 (2 tops in 6 attempts, 2 zones in 5 attempts), meaning I didn’t even reach the zone on 3 of the 5 boulders! Luckily my score put me in 9th place in my group, meaning I would advance to semi-finals on Saturday morning. After qualifiers I spent the rest of the evening relaxing and getting ready for my early wake-up time for semi-finals. Semi-finals were also set very hard. A video and breakdown of the boulders is below. Boulder 1: A difficult first move led to some more vertical top movement. I definitely think I could have sent this boulder if I had figured out the bottom section sooner. Boulder 2: This boulder was comprised of mainly small, dual-texture crimps. I fell going from the zone to the next volume. Boulder 3: Another integrated dyno (like they had set the day before). I was close to sticking the dyno, but was unable to make it happen. Boulder 4: A hard, gritty vertical boulder…I fought hard on these volumes but was unable to get much further than the first few moves. Having no tops, my final score was 0T0 2Z7 (0 tops, 2 zones in 7 attempts). While this was an especially difficult round for me (and everyone else), I walked away in a proud 14th place. As always, Vail was a very fun competition. It’s nice to have the opportunity to compete in the US after traveling abroad for the majority of the year! My next World Cup is in Munich in August, then I have the World Championships in Innsbruck a few weeks later. I am excited to spend time in Iceland and then get some good weeks of training once I am home! What a season it has been so far. I just completed my fifth World Cup of 2018 in Tokyo, Japan. Next weekend (June 8-9) I compete in Vail, Colorado at another World Cup, then I have a 10 week break until the Munich World Cup in August. Oddly enough, Tokyo has seemed like my shortest trip of the season. After spending two weeks in Switzerland/Russia and two weeks in China…a six day trip to Japan is easy! We arrived in Japan on Tuesday (May 29) afternoon after a quick two hour flight from Phoenix to San Francisco, then a quick 10 hour flight from San Francisco to Tokyo. I am not even kidding…at this point a 10 hour flight does not seem too bad compared to a 14 hour flight! After checking into the hotel around 4:00 PM, I took a nap and woke up at midnight. After eating a late, late dinner ordered via room service, I fell back asleep around 2:00 AM and woke again at 5:00 AM. That might sound like a crazy sleep schedule, but ultimately it put me on Japan time very quickly. That morning we had a Team USA training session at B-Pump Ogikubo. B-Pump is an incredible gym in Tokyo with an amazing competition wall, great hold variety, and awesome setting. I would not say my climbing quite felt 110% that morning…but it was nice to get loose after all of the traveling and sleeping! After the B-Pump session I went back to the hotel, caught a quick nap, and did a strength training workout at the hotel. On Thursday I went to Disneyland Tokyo! I am a big Disneyland fan and have made it my goal to visit all of the Disney Parks across the globe. So far I have done Anaheim, Orlando, Paris, and now Tokyo! After visiting Disney Tokyo I only need to cross off Disney Shanghai and Disney Hong Kong to have completed my goal! I was lucky enough to go to Disneyland with my good friend Sean McColl. We had a great day walking around the park and getting on as many rides as possible. We were there for 10.5 hours! It is always difficult to decide which ride is my favorite…but I always love Pirates of the Caribbean. Another one of my favorites, Space Mountain, was closed on the day we went, but I went on so many other fun and new rides (like the Monsters Inc. ride!). The next day I went to B-Pump in the morning for a light session to loosen up for the competition. After B-Pump I visited the MAMMUT store in Shinjuku, which was amazing! MAMMUT Japan has some really cool clothes/shoes that I was lucky enough to take home with me. Everyone at MAMMUT was so nice and I loved getting to meet everyone. After my visit to MAMMUT I went across the street to buy some souvenirs for my friends, then back to the hotel for an early bedtime since the competition started the next morning. While the competition was hosted in Hachioji (part of the Tokyo Metropolitan area), I opted to stay centrally in Tokyo and take the one hour long train ride every morning. Isolation was open from 7:00-8:00 AM…meaning I woke up at 4:00 AM every morning to eat breakfast, get ready, and make sure I arrived at isolation on time. Qualifiers went very well for me in Tokyo. A video and breakdown of the boulders is below. Boulder 1: A slightly overhanging boulder with crimps on volumes, the top was actually the easiest part with bigger/better holds! Boulder 2: A definite power boulder, the crux was getting the zone hold (which was a jump to a Flathold pinch where your feet cut). Once you got the zone the rest of the boulder was not too difficult however. I also completed this boulder. Boulder 3: A vertical boulder where you stand between volumes, I had trouble on this one and did not reach the zone. Boulder 4: Another power boulder with greasy holds on an overhanging wall, I reached the zone on one of my last attempts and did not finish the boulder. Boulder 5: A slab/dihedral that involved a lot of standing on small holds or big/sketchy holds, I reached the zone on my first attempt and sent the boulder on my second attempt. With a score of 3T4Z, 7 12 (3 tops, 4 zones with 7 attempts to top and 12 attempts to zone), I got off the wall in 9th place. It was nerve-racking waiting to see if I would make semi-finals in the top 10…but luckily my 9th place finish held strong! I would be heading to my first semi-finals of the year in the morning. Below is a breakdown of the boulders in semi-finals and another video. Boulder 1: A classic slab! I am pretty sure I spent a good two minutes on this boulder. Boulder 2: Powerful with pinches I did not reach the zone on this hard boulder. Boulder 3: Another powerful boulder. The first move was a toe catch with the next move being a jump to the zone (which was a small crimp). After the zone you had to climb around a half-sphere volume. I think only two people sent this boulder…it was really hard! Boulder 4: This boulder was a sure heartbreaker for me. Set in the dihedral, I fell while matching the finishing hold! My score in semi-finals was 1T3Z, 1 6 (1 top, 3 zones with 1 attempt to top and 6 attempts to zone). I climbed my way into 10th place, my best World Cup finish to date! I am so proud of my finish in Tokyo. After not making semi-finals in any of the previous World Cups this season, it was very exciting to make semi-finals and place so highly! Now I am onto my next competition in the circuit, the Vail World Cup! In this blog we pick up on part 2 of my China adventure, the Tai’an World Cup! After Chongqing we flew to Shanghai to spend a few days there before the Tai’an World Cup. Shanghai has a great gym, PONGO, and the city of Shanghai is very fun to visit with all of the exciting sights to see! On Thursday we took a train ride from Shanghai to Chongqing, it was only 4 hours long on a bullet train. I got to see a lot of the green Chinese countryside during the train ride. I also caught up on a few episodes of My Favorite Murder (this is my favorite podcast to listen to when I travel). I spent the better part of Friday morning doing a workout outdoors, which was fun for me. After my morning workout we walked around town a little bit and ended up visiting the Daimiao Temple. The temple was beautiful and expansive, it seemed like it went on forever! Other members of the team attended registration and the technical meeting, so I spent the rest of the night relaxing. The women climbed in the afternoon again on Saturday. We were split into two separate groups (A &B) due to the volume of competitors. Below is a video of my highpoint on all of the boulders and then a short breakdown of how the boulders felt to me. My final score was 3T5Z, 6 7. An easier reading of the score is: 3 Tops, 5 Zones, 6 Attempts to Top, 7 Attempts to Zone. Boulder 1: With a high foot at the beginning and some delicate moves near the end I flashed this boulder, making it a great start to the round. Boulder 2: Funky and finicky is the best way to describe this boulder. None of the hands or feet were particularly bad…but something about their positioning made the movements not feel totally comfortable. Luckily I also flashed this boulder. Boulder 3: This boulder was strange because it did not feel particularly difficult until the move below the lip where your feet cut. I fell at this move a few times before deciding to rest and save my energy for the next boulder. Boulder 4: This boulder felt especially tricky for me. I had some issues moving around the start volume, but once I was closer to the top the holds got better and I was able to send the boulder. Boulder 5: I felt confident going into this slab boulder, but couldn’t quite stick the second to last hold. After I finished the round I realized that the issue was that I had been going with the wrong hand to the hold…oops! My climbing put me in 12th place in my group and 23rd overall. Once again I missed out on semi-finals…but this performance felt much better than Chongqing. Competitions are tough and there is always something new to learn. After this competition I was able to enjoy 2 lovely weeks at home before heading off to Tokyo! What a whirlwind 2 weeks it has been. I had two World Cups in China, the first taking place in Chongqing and the second in Tai’an. I’ll start discuss Chongqing in this blog post and then Tai’an in my next blog post. After 3 plane flights and a 24 hour travel day we arrived in Chongqing, China around midnight. We checked into the hotel and promptly fell asleep…a bed never feels quite as comfortable as when you haven’t slept for almost an entire day! The next morning I went to Black Ram for a session to shake the jet lag off. Black Ram is the bouldering gym everyone usually trains at in Chongqing before the competition. The gym is unique because it’s located in the middle of an amusement park. Needless to say…it’s always an adventure getting there. After the session at Black Ram we went back to the hotel to catch a nap and catch up on even more sleep! The next day was more or less of the same thing, wake up, go to the gym, and then head back to the hotel for a nap! My only non-training day in Chongqing was on the Friday before the competition. We walked around the city a little bit and then went to registration and the technical meeting. For me the competition really feels like it begins when I go to the technical meeting…it makes me feel like the competition is right around the corner (which it is!). I have been to Chongqing twice before, 2015 and 2016. This was my first experience at the new Chongqing venue. The wall was very nice and very tall! Once again, qualifiers took place on Saturday afternoon for the women. Since there were so many competitors we climbed in two groups (A & B). Below is a video of my highpoint on all of the boulders and then a short breakdown of how the boulders felt to me. My final score was 1T4Z, 3 5. An easier reading of the score is: 1 Tops, 4 Zones, 3 Attempts to Top, 5 Attempts to Zone. Boulder 1: This boulder got everyone’s knees with a crucial knee bar in the second move! After the crucial knee bar you cruised up an overhanging headwall to the finish. I reached the zone on my first attempt on this boulder and I could not make the move to the top. Boulder 2: The first move was a small jump followed by a high foot and a press into some geometrical volumes. The press felt really tough for me and is where I fell on the problem. Boulder 3: A big dyno for the first move, the rest of the boulder involved pressing. I fell right after the zone on my second attempt. Boulder 4: Mainly comprised of shallow crimps on volumes, this boulder felt the longest to me. I reached the zone on my first attempt and fell near the top. Boulder 5: I felt confident going into this boulder since it was on a vertical wall. After an integrated move at the beginning I managed to stick the tricky finish on my third attempt. Despite coming into Chongqing feeling super confident…I just didn’t feel that great during the round. I think a lot of my weaknesses were exposed, which makes the round hard, but is ultimately good for my training! After the Meiringen World Cup I spent Sunday paragliding in Lauterbrunnen (a must-do if you have the opportunity) and had a photo shoot with MAMMUT on Monday and Tuesday. While I have been parasailing (over the ocean) before, I had never been paragliding. This was also my first time walking in serious snow and being on a ski lift! Thank you Brian (a climber I met last year in Meiringen) for setting up this great experience. I’ve attached some photos at the bottom so you can check them out if you would like. The MAMMUT shoot on Monday/Tuesday was a blast as well. Jakob Schubert (a super strong climber and really nice guy) was also at the shoot on Monday, while I was by myself on Tuesday. The only hiccup we had during the shooting was when I left one of the items of clothing we needed at the gym in Lenzburg and realized it after we arrived at the gym in Uster! Other than that, the shoot went off without a hitch and I am so excited to see the photos/videos. Late Tuesday night we flew to Moscow so we could begin our Russian adventures early the next day! On Wednesday morning we went to Tokyo to get in some training with the Canadian team (Sean McColl, Seb Lazure, Nathan Smith, and Malek Taleb). The gym was great and it was nice to have a fun climbing session to unwind in between the World Cups. After the gym we visited the Bolshoi and walked around downtown Moscow, which was an amazing experience! I also want to note that we ate at an amazing restaurant, Mari Vanna, where they have a resident restaurant cat (Benjamin). He was sweet, friendly, and made the experience unique. I also love cats…so I was in heaven! Qualifiers took place on Saturday afternoon for the women. Since there were so many competitors we climbed in two groups (A & B). Below is a video of my highpoint on all of the boulders and then a short breakdown of how the boulders felt to me. My final score was 3T4Z, 8 5. An easier reading of the score is: 3 Tops, 4 Zones, 8 Attempts to Top, 5 Attempts to Zone. Boulder 1: Only a few moves long, this boulder began with a jump to a good hold, then a gaston to a crimp on a volume, and finishing on a large crimp. I felt really confident climbing this boulder! Boulder 2: More strenuous than the first boulder I fell on the last move of this boulder off of a slippery sloper. Boulder 3: Beginning with a dyno, this boulder was probably my favorite of the round. After a dyno, you had a few remaining moves on crimps on volumes and then you were finished. Boulder 4: This was the one boulder where I struggled with the beta at the start and eventually figured it out when I was running out of time! I wasn’t trying the wrong beta exactly, but I think a more dynamic beta suited my climbing style better. My initial go-to beta was a left arm press. Other competitors used the left arm press successfully, but the more dynamic beta felt more doable for my personal style. Boulder 5: A delicate slab, matching the finish hold felt nearly impossible on this boulder. I fell at the top a few times while trying to adjust my feet for the match. Luckily I did the match in the knick of time! While I placed better than last week in Meiringen, I still missed semi-finals in 27th place. But again I climbed really, really well and felt great. It’s kind of a crazy thing to feel like you are climbing better but placing worse (in comparison to my first two WC’s of the season last year). Even though I didn’t make semi-finals in either competition (Meiringen or Moscow)…I was not bummed out at all. It’s nice to feel like you are climbing well and to not feel stressed when you are competing. I feel like I am really capturing the experiences of the World Cups this year and I am confident that my competitions will continue to get better and better. Now I am at home for a few days before I fly off to China for the Chongqing and Tai’an World Cups! These past 2 weeks have been a mix of transit, adventure, competition, and all-around having a great time! The World Cup season started off in Meiringen, Switzerland on April 13-14. I flew into Zurich with my mom on the Monday before the competition. That night the US Team had a training session at Kletterzentrum Milandia. On Monday our training session at Milandia consisted of an onsight round of 4 boulders, followed by flash attempts on 5 other boulders. It was a good way to break ourselves in for the upcoming competition and get used to the competition style we would be seeing. A big thank you to the setters at Milandia for creating some fun boulders for us to climb! On Tuesday our training session at Milandia was more low-key, we had 6 boulders set by Josh Larson (thanks Josh!) to work on together. The boulders were mainly on the slab and definitely helped tone up our slab climbing skills! We spent Wednesday sightseeing in Zurich, with the highlight being our visit to the Grossmünster! We walked A LOT this day and certainly made our legs a little tired…but it was worth it to see such cool places. Thursday was a mellow day, we took the train to Meiringen and I got prepped for my competition the following day! Qualifiers took place on Friday afternoon for the women. Since there were so many competitors we climbed in two groups (A & B). Below is a video of my highpoint on all of the boulders and then a short breakdown of how the boulders felt to me. My final score was 2T4Z, 2 6. An easier reading of the score is: 2 Tops, 4 Zones, 2 Attempts to Top, 6 Attempts to Zone. Boulder 1: This boulder was a tricky slab to say the least! Getting off the starting holds required a high right foot and slowly inching your way up the wall. While I didn’t send this boulder I reached the zone! Boulder 2: Powerful but straightforward, this boulder didn’t feel too difficult. As long as you kept moving through the boulder and maintaining accuracy, many people were able to send this boulder. Boulder 3: Another powerful boulder, I had a difficult time moving off of the zone hold. It felt like a bad hold and really slippery to move off of to the next holds. I reached the zone on this boulder. Boulder 4: On this boulder the first move was a jump onto decent holds. The rest of the boulder involved slowly moving off of the bad last hold to the actual finish hold, which was a jug! Boulder 5: This boulder felt much like boulder 3 to me. I felt solid until I had to try and move onto the zone hold, I couldn’t quite figure it out and left this boulder without a zone. My score didn’t put me into semi-finals and I ended up placing 34th. I definitely wish I had made the next round, but I personally climbed really well. It was the most confident round I had had in a long time and I had a lot of fun. All of the positive feelings from Meiringen set a good tone going into Moscow! I just returned home from one of my biggest competitions of the year, Open Bouldering Nationals. 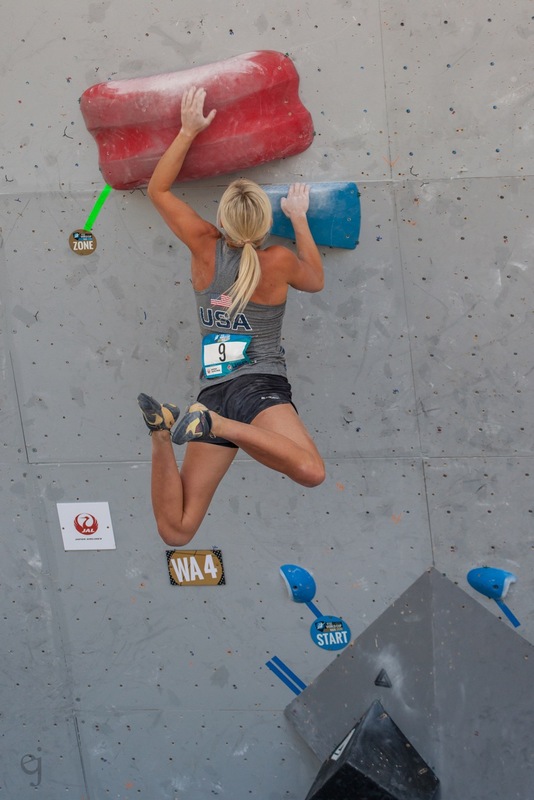 This event took place over 2 days in Salt Lake City, Utah and ultimately decided the 2018 US Bouldering Team. Qualifiers took place on Friday morning. We climbed 5 boulder problems in a 4 minutes on, 4 minutes off onsight format. Below is my analysis of each boulder as well as a video of my send/high point. Boulder 1: A nice slab with a tricky first move. Once you did the move across the slab to the side wall you were mostly finished with the hard part of the boulder. The remainder of the boulder wasn't too bad as long as you were careful and paid attention to your feet. Boulder 2: All volumes, I definitely had a hard time working this problem and figuring it out. This pointed out a weakness for me for sure! Boulder 3: A clean overhanging line with a committing first move, I made sure to take my time with the overhanging section so I didn't have to do the start move again! Boulder 4: This boulder is definitely witnessed better in the video. It was slightly overhanging with a committing heel hook at the top! Boulder 5: A drop down to volumes, a quick crawl across the volumes, and then a jump up the vertical wall...I thoroughly enjoyed this boulder! My performance in qualifiers put me in 8th place and secured a spot in semi-finals the following morning. The format of semi-finals is slightly different than qualifiers, we only have 4 boulders, but we switch to a 5 minutes on, 5 minutes off onsight format. Boulder 1: A much more delicate slab than yesterday, I liked the overall flow of this boulder. Boulder 2: This boulder wasn't super powerful until the finishing move. Only 2 competitors (Alex & Ashima) sent this boulder. Boulder 3: A very powerful problem with campusing in the middle section, I did not have my best performance on this boulder. It definitely pointed out another weakness for me. Boulder 4: A vertical climb with a difficult mantle press at the beginning. This is the one boulder I felt like I should have sent but didn't. My climbing in this round put me in 10th place. While I climbed well, only the top 6 athletes make finals. However, 10th place should secure a spot on the US Bouldering Team for 2018, which was my ultimate goal of the event. Overall it was a fun, exciting weekend, and showed me many areas in which I can and need to improve. For the next few months I will be training and preparing for the upcoming World Cup season. As of right now I plan to attend all of the events, so it will be a busy year ahead! And as always...thank you for the support from my amazing sponsors! I just returned home from the second National Cup of the 2017-2018 season, the Battle of the Bay at Dogpatch Boulders in San Francisco. Qualifiers took place on Friday with the standard modified redpoint format. We have ten boulder problems to attempt and were scored by zones on these problems. The only difference between this redpoint and the Yank 'N Yard redpoint was that we had a 4 hour redpoint (instead of 3 hours) and were limited to 8 attempts per boulder. I completed 9 out of the 10 boulders in qualifiers, putting me in 7th place going into finals. The qualifying boulder problems were a mix of technique and power. The level of boulders was slightly different in San Francisco than New Mexico. The hardest boulders in New Mexico were harder than the hardest boulders in San Francisco, but the easiest boulders in New Mexico were also easier than the easiest boulders in San Francisco. Boulder 1: This boulder was vertical and involved using quite a few volumes. Getting to zone 5 required a lot of balance, with the next cruxy move being the finishing move, to zone 25. Almost everyone had trouble with the finishing move, except for the women who sent the boulder. Boulder 2: A classic slab boulder, I felt very confident that I could send this boulder. The first move was a tricky stand-up move, then you moved over to a huge pinch and placed your foot on a small volume. The rest of the boulder was fairly straightforward, but the beginning moves of this boulder were definitely the most difficult moves of the boulder. Boulder 3: Very straightforward and overhanging, this boulder had some okay crimps and decent feet. The hardest move for me was the finishing move, which I ended up falling on twice. Boulder 4: I was very excited to get to zone 15 on this boulder! The first moves were difficult and jumping to zone 5 proved to be not easy to stick. Getting to zone 15 was what helped me land in 4th place and not 5th place. Overall the competition went well. 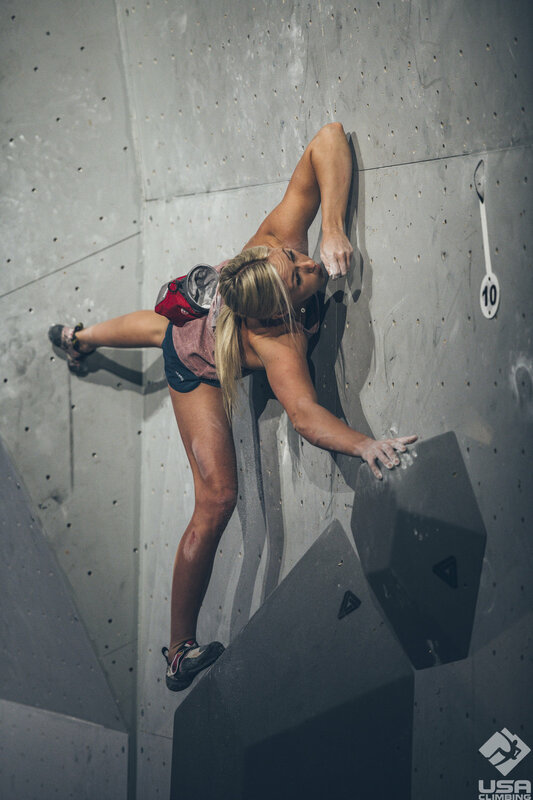 There are definitely things I can improve upon, but I look at each competition as a learning experience, a chance to climb with other strong women, and the opportunity to climb great boulder problems. My next competition is the Violet Crown National Cup at Crux Climbing Center in Austin, Texas. I have 5 weeks until my next competition and I am looking forward to training and enjoying some time at home until then.